LiDCo manufactures intravenous cardiac sensor electrodes for the medical industry. Labman collaborated with LiDCo to manufacture a number of systems, one of which fills blood flow sensor electrodes with electrolytic gel. Sacrificial humidity maintaining vials are also filled with gel in the same machine. At the heart of the system is a bespoke large bore glass and PTFE syringe. This is held in an air circulated oven held at an elevated temperature to reduce the gel’s viscosity. The syringe slowly and smoothly directs the gel over a heated ‘weir’. This allows the system to very accurately maintain the liquid gel surface level. 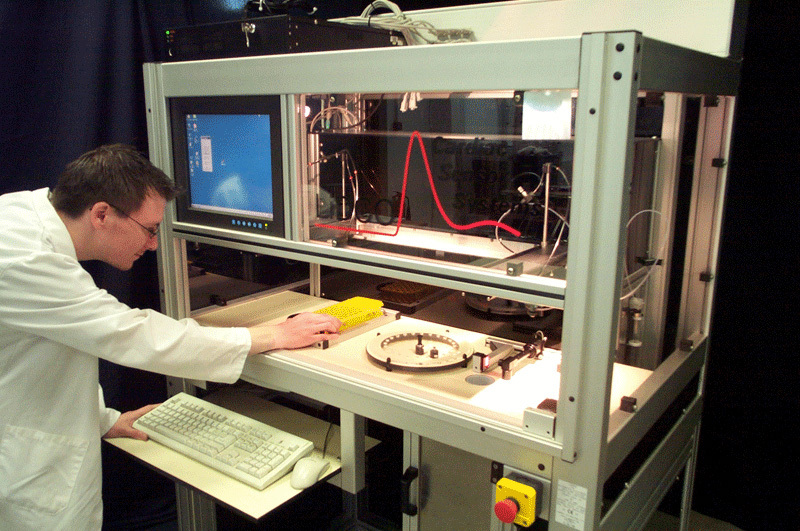 Electrode bodies are robotically picked and are touched onto the surface of the gel. The gel is smoothly aspirated to a preset volume. Subsequently, a special procedure builds gel onto the electrode exterior using a vision system. All of this is performed in a clean room environment. LiDCo also manufactures intravenous cardiac sensor electrodes for the medical industry. This system coats a polypropylene sensor with a silver based paint and holds over 400 unpainted electrodes. The system coats two electrodes at a time using precise liquid handling syringes and a secondary optical sensor to check for overfilling. A flicking operation is performed to remove excess paint from the outside of the electrode. Each sensor is then held in a drying rack until it has dried sufficiently to be dropped into a collection bin ready for the next stage of the preparation process.